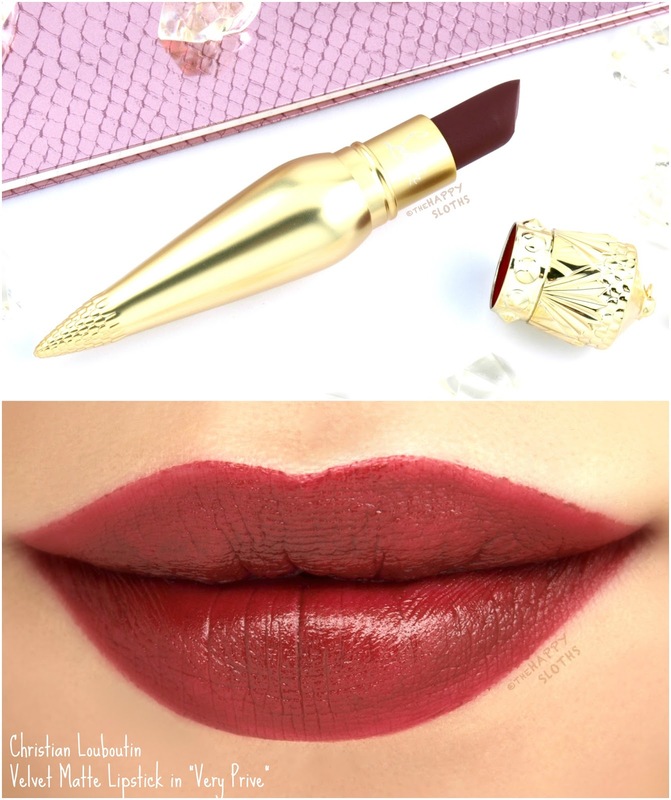 Christian Louboutin | Velvet Matte Lipstick in "Very Prive"
With a matte gold body, the Christian Louboutin Velvet Matte Lipstick is luxurious weighted for a very expensive feel. The shiny gold cap is carved with Art Deco-inspired patterns and its underside is painted a bold red to pay tribute to the iconic Louboutin red sole. 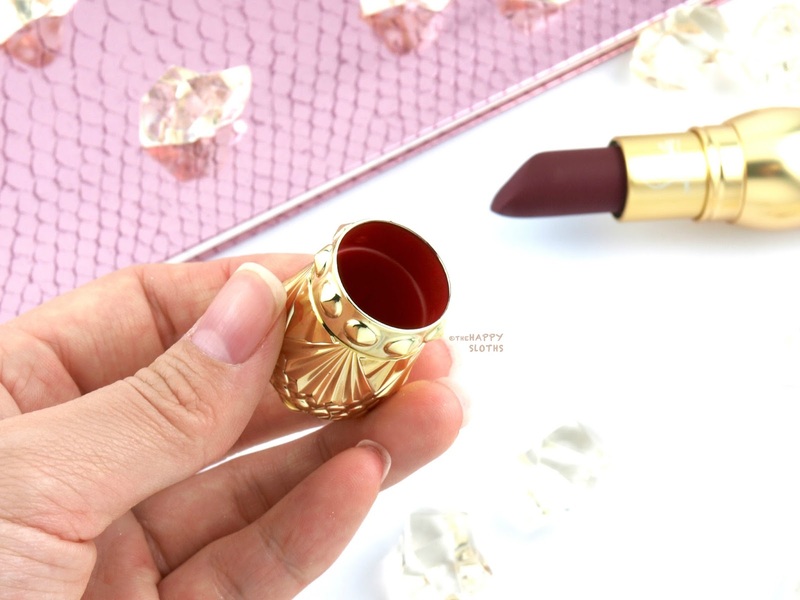 Like all the other Christian Louboutin lipsticks, the Velvet Matte packaging has a little hoop on its cap so if you want to, the lipstick can be worn as a necklace with the included gold silk ribbon. 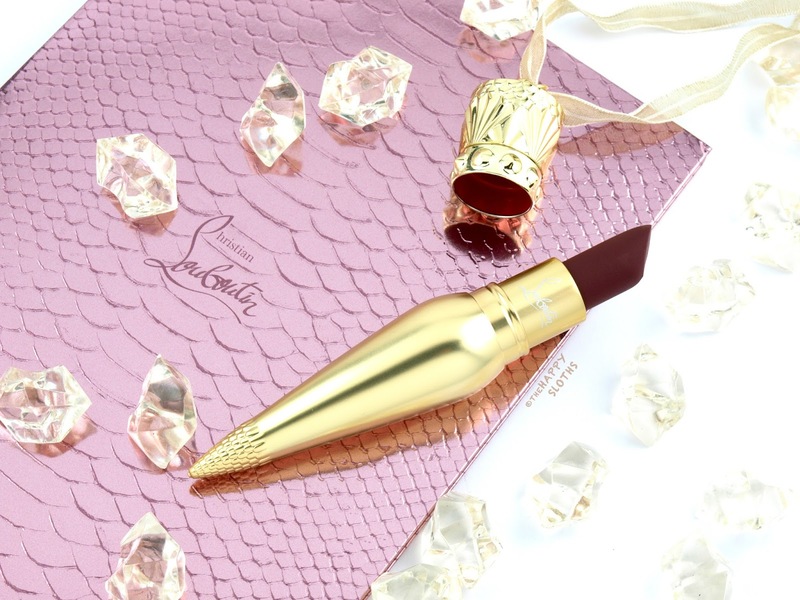 In contrast to the Christian Louboutin Silky Satin and Sheer Voile lipsticks, the Velvet Matte formulation promises a "soft touch finish" with a "full coverage in one stroke". I have here the shade "Very Prive", a dark wine red with a warm, plummy undertone. Although very pigmented, the color is slightly patchy, which really isn't unexpected as dark wine reds tend to be a little problematic. With a thicker application, a mostly even and opaque coverage can be obtained but this is definitely a shade I would recommend pairing with a lip liner. Additionally, the color is really not that matte. Although not as shiny as the Silky Satin formulation, this Velvet Matte has a noticeable sheen. The formulation is very moisturizing and comfortable on the lips and wears fairly well for up to five so hours with minimal eating. Overall, this is a beautiful vampy red lipstick. Although creamy and pigmented, the formulation is slightly patchy. If this were an average, $30 department store lipstick, I'd say that it's not bad but given that it's from Christian Louboutin and costs a hefty $120, I would expect a better coverage. With that said, the packaging is stunning as always. So if you really like the color and don't mind pairing it with a lip liner, then it's worth checking out in person! Christian Louboutin Beauty is available in Canada online at Christian Louboutin, in stores and online at Holt Renfrew and Nordstrom.